My group classes are designed so that they can be taken multiple times. This allows you to move at your own pace and really master the skills taught before moving on. If you repeat a class and the exercises are too easy I can make them harder. This is better than being in a class that is too hard for you and getting frustrated and dropping out. 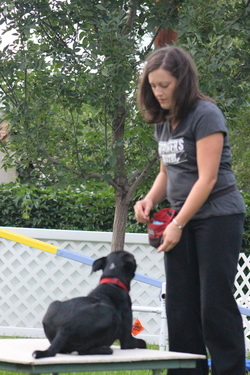 When you and your dog have mastered the skills taught in that class, you are ready to move on to the next class. Everyone moves at a different speed so don’t judge yourself based on others-only track your progress. If you are unsure if you are ready to move to the next class or next level please feel free to ask Jennifer for her assessment. Grad School, Grad School Elite, Agility for Fun Level 2 and Off Leash Manners Club Level are intended to be taken multiple times. Why? Because I really want to give my students a fun class that they both enjoy and are challenged in. These classes are 100% game based-musical chairs, tic-tac-toe, etc. and are super FUN! We have dogs in our lives as companions. Make your training class a “date night” with your dog and everyone wins. You both have fun and learn at the same time. These classes offer different games, dogs, and distractions every semester so it’s never the same class twice. These differences allow your dog to solidify their skills and to continue to build their relationship with you. Good relationships don’t just happen. They take time and patience. Are you actively building your relationship with your dog? If not, make a date with your dog! You won’t be sorry!